in 360i News with tags Crisis Communication, digital education for nonprofits, nonprofit marketers, seo, social media Both comments and trackbacks are closed. 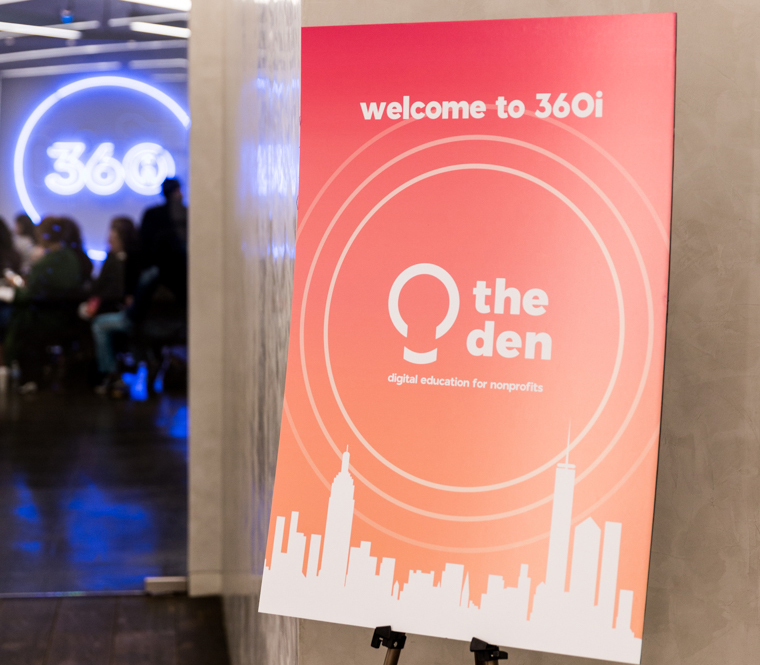 Yesterday at our New York headquarters, 360i hosted the fourth iteration of ‘The DEN’-Digital Education for Nonprofits. The DEN is a free, one-day workshop designed to provide free tools, research, best practices and tricks of the trade for being a smart, nimble nonprofit marketer in the digital age. More than 100 nonprofit professionals attended the event, with representation from nearly 90 organizations. The day began with a welcome from Chairwoman Sarah Hofstetter, followed by sessions on Insights, Social Marketing, Paid Social, SEO & SEM, user Experience, Influencer Marketing, Crisis Communications and presentations from our partners at Facebook and Google. To bring the event to those who couldn’t attend in person, we livestreamed the morning and afternoon sessions on Facebook, and shared insights from each session on Twitter using #360iTheDEN. This marks the fourth time in two years that 360i has hosted a DEN event, with previous workshops being held in Chicago, Atlanta, and New York. The teachings of The DEN have impacted more than 50,000 nonprofit marketers over the years. Thank you to our partners and speakers who made this day possible, and to all the nonprofit professionals who joined us for The DEN. Follow 360i on Twitter, Facebook and Instagram, for more information on the next DEN workshop.